Nearly 18.7 billion kilometers from Earth — about 17 light-hours away — NASA’s Voyager 1 spacecraft is just about on the verge of entering interstellar space, a wild and unexplored territory of high-energy cosmic particles into which no human-made object has ever ventured. Launched in September 1977, Voyager 1 will soon become the first spacecraft to officially leave the Solar System. Or has it already left? Rather, scientists look at Voyager’s data for evidence of a shift in the type of particles detected. Within the transitionary zone that the spacecraft has most recently been traveling through, low-energy particles from the Sun are outnumbered by higher-energy particles zipping through interstellar space, also called the local interstellar medium (LISM). 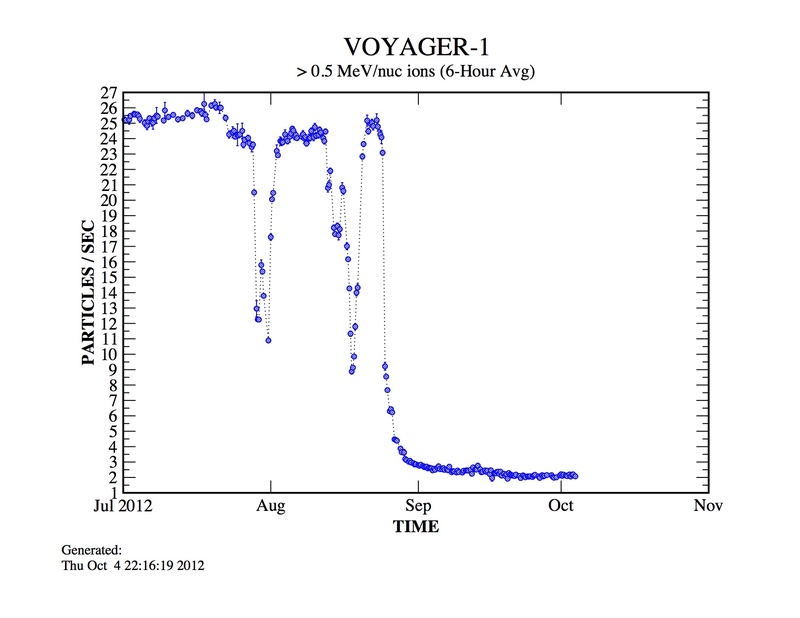 Voyager’s instruments have been detecting dramatic shifts in the concentrations of each for over a year now, unmistakably trending toward the high-energy end — or at least showing a severe drop-off in solar particles — and researchers from the University of Maryland are claiming that this, along with their model of a porous solar magnetic field, indicates Voyager has broken on through to the other side. “It’s a somewhat controversial view, but we think Voyager has finally left the Solar System, and is truly beginning its travels through the Milky Way,” said Marc Swisdak, UMD research scientist and lead author of a new paper published this week in The Astrophysical Journal Letters. According to Swisdak, fellow UMD plasma physicist James F. Drake, and Merav Opher of Boston University, their model of the outer edge of the Solar System fits recent Voyager 1 observations — both expected and unexpected. In fact, the UMD-led team says that Voyager passed the outer boundary of the Sun’s magnetic influence, aka the heliopause… last year. But, like some of last year’s claims, these conclusions aren’t shared by mission scientists at NASA. “Details of a new model have just been published that lead the scientists who created the model to argue that NASA’s Voyager 1 spacecraft data can be consistent with entering interstellar space in 2012,” said Ed Stone, Voyager project scientist at Caltech, in a press release issued today. “In describing on a fine scale how magnetic field lines from the sun and magnetic field lines from interstellar space can connect to each other, they conclude Voyager 1 has been detecting the interstellar magnetic field since July 27, 2012. Their model would mean that the interstellar magnetic field direction is the same as that which originates from our sun. Whether still within the Solar System — however it’s defined — or outside of it, the bottom line is that the venerable Voyager spacecraft are still conducting groundbreaking research of our cosmic neighborhood, 36 years after their respective launches and long after their last views of the planets. And that’s something nobody can argue about. Built by JPL and launched in 1977, both Voyagers are still capable of returning scientific data from a full range of instruments, with adequate power and propellant to remain operating until 2020. Read the full UMD news release here, and find out more about the Voyager mission on the NASA/JPL website here. Note: The definition of “Solar System” used in this article is in reference to the Sun’s magnetic influence, the heliosphere, and all that falls within its outermost boundary, the heliopause (wherever that is.) Objects farther out are still gravitationally held by the Sun, such as distant KBOs and Oort Cloud comets, but orbit within the interstellar medium.